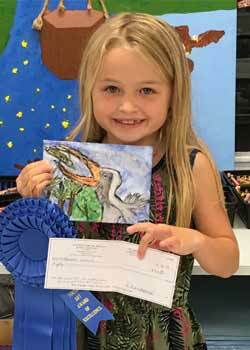 As part of our commitment to bring art education into the community, a Budding Artist Competition for grades 4-12 or ages 7-19 was integrated within the art show. 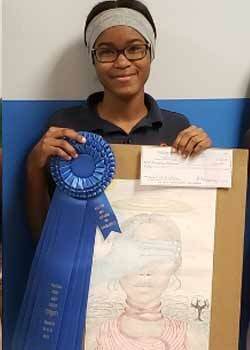 Sponsored by Institute for the Arts & Education, the associated 501c3 non-profit, students are encouraged to submit his/her original art that was publicly displayed in the art show the entire weekend. 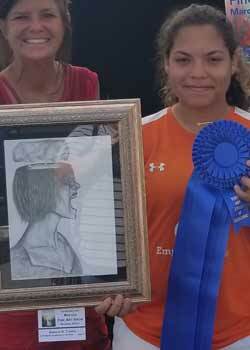 Belle Manrique was the Budding Artist Judge. Criteria was based on the same as the professional artists in the show – originality, and technique/execution. 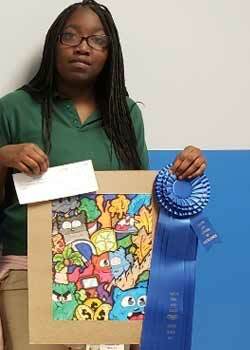 Each winning youth artist received the same, two-foot-long beautiful ribbon that the professional artists received. 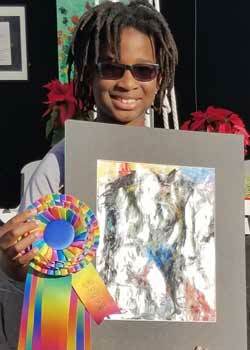 There was $250 in Youth Art Awards as students begin to learn the rules of being part of a professional art show. 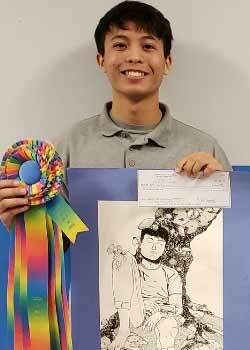 A special mention to Youth Artist Nalin Isme. Since 2013 when Nalin was age five, he has entered his work into the Youth Art Competition. He has now won 12 out of 14 times – with all different judges! Congratulations to Nalin! A special thank you to Art Teachers Elizabeth Olancin with Gulf Elementary and Cindy Collins with Gateway Intermediate Charter School for always entering their students in this very important program, which is unique and one-of-a-kind within Hot Works shows. To date, more than 2,800 students have participated in this program.